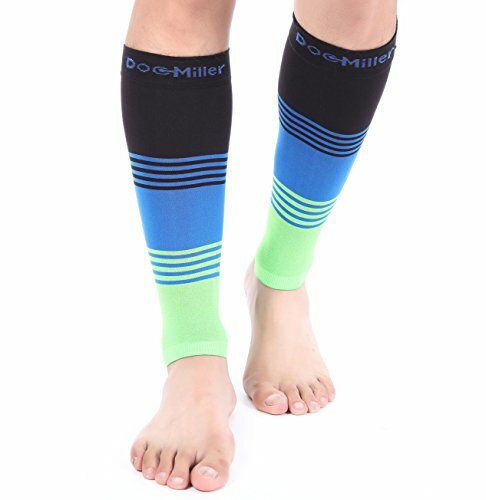 Doc Miller Calf Compression Sleeves are made of Durable, Breathable, Comfortable, Premium fabric made of high-grade Nylon (77%) and Spandex (23%) for a snug, comfortable, compressive fit. The sleeves aid in faster recovery for improved performance and support. By boosting blood circulation in your legs and preventing injuries, the sleeves allows you to feel fresher for more activity. The perfect graduated support ranging from 20-30 mmHg allows for blood flow where needed. Perfect opaqueness provides a professional look and feel and the compression lasts a long time. The cute open toe and closed toe versions can be used as pregnancy maternity stockings. 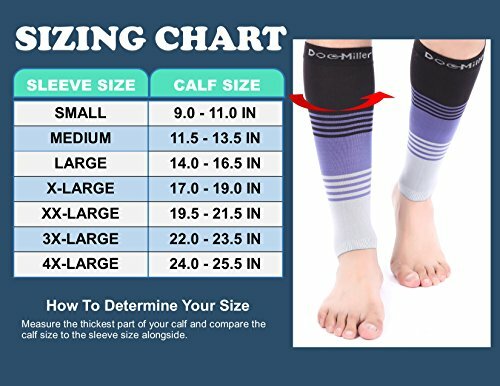 The sizing chart displays product sizes for a range of calf sizes including plus sizes. Effective for both men, women and teens, use them for a wide range of activities - from warming up to sessions of Tennis, Basketball, Racquetball, Football, Soccer, Hiking, Cross Fit, and other athletic activity. Fabric characteristics keep it comfortable regardless of season. If you are pregnant, stand a lot during the day as a nurse, in retail or construction this product will prevent soreness and aching feet. If you travel by air, this product may help reduce fatigue and Deep Vein Thrombosis (DVT). This product is recommended for those suffering from shin splints, calf pain, swelling in the feet, inflammation, pain in leg, soreness and aids in faster recovery from sports activities and running. Studies show compression accelerates recovery from soft-tissue injuries and reduces the severity of delayed onset muscle soreness (DOMS) after working out. This product may also help you with Restless Legs Syndrome (RLS). Don't wait anymore! Experience the benefits yourself. Different sizes sell out - if you see your favorite color/size click Add to Cart. Your calves and legs will thank you! 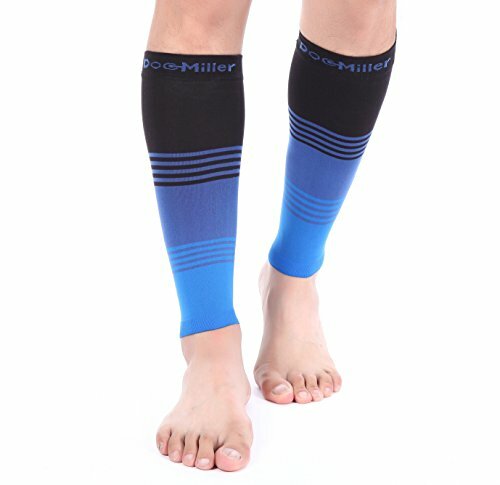 TIRED OF BUYING compression legwear that keep falling down? That need frequent replacing because they lose their compression after a few weeks? That irritate your skin? Or are flashy and act like a billboard for the brand you're wearing? Make the switch to premium compression sleeves and socks that is breathable, anti-odor & made of durable high quality compression fabric Nylon 77%, Spandex 23%. With seamless woven construction, these fit snug with no loss of compression, wear after wear. FEEL IT WORK: This is a durable KT tape substitute by form-fitting naturally on your legs thus providing you support & stretch where needed. 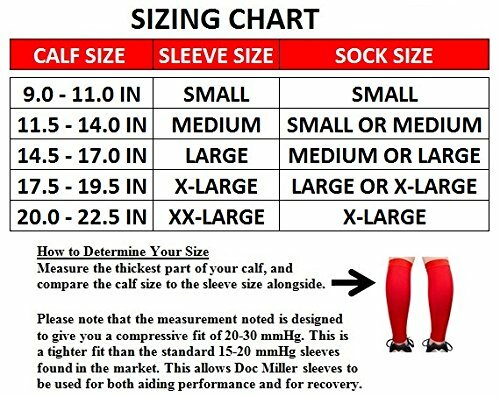 Whether you have aching calves, leg cramps, swelling or edema, shin splints, POTS or varicose / spider veins these sleeves allow you to train harder, recover faster & feel stronger. They help boost circulation in your legs & reduce muscle soreness for recovery afterwards. Try these & notice the improvement - you'll wish you had found ages ago! GET YOUR SIZE: The fit and construction of our sleeves ensure that the fit is snug without discomfort by bunching or slipping during activity. Designed for men and women, these are available in a wide selection of sizes and colors, including Argyle patterns - check the sizing chart in the pictures area. The designs include toeless (open toe), closed toe and calf sleeves. 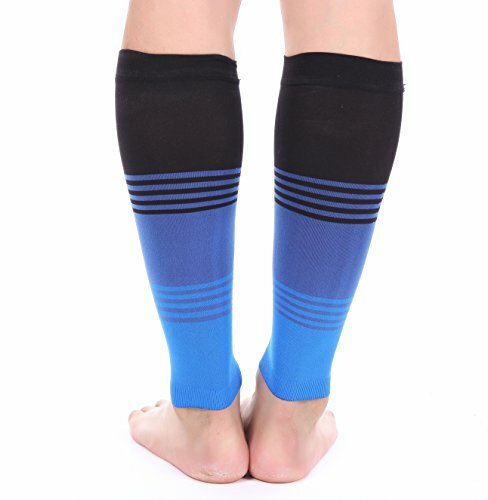 The socks deliver medical grade 20-30 compression and are knee high and can be used during pregnancy. SUITS YOUR ACTIVITY: The sleeves are beneficial for for running, hiking, martial arts, crossfit, volleyball, basketball, cycling, baseball, yoga, workouts or any fitness activities. Whether high or low or high impact, these enable you to warm up safely and recover quickly. 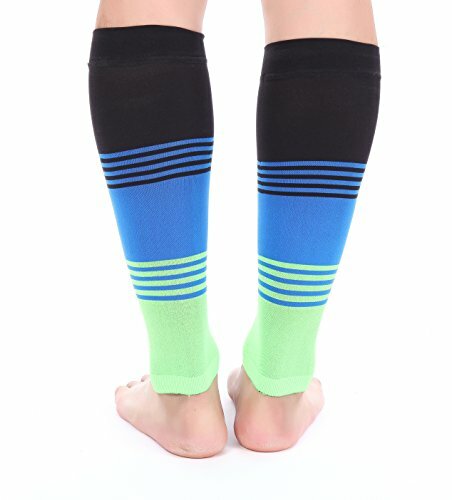 The calf sleeves & socks are also perfect for everyday use especially while pregnant, for people in retail, air travel, jobs as a nurse or in construction that require a lot of standing on your feet. Or to cover up tattoos! EXCEPTIONAL VALUE + 100% MONEY BACK GUARANTEE: Sold as a pair. These are as close to medical grade compression prescribed by many doctors but without the sticker shock. Buy more and lock in the low price. Know that when you buy from us today, you are covered by our 90 day, money back satisfaction guarantee & world class customer service!! Buy more and save more off already low prices. Get two for uninterrupted use.